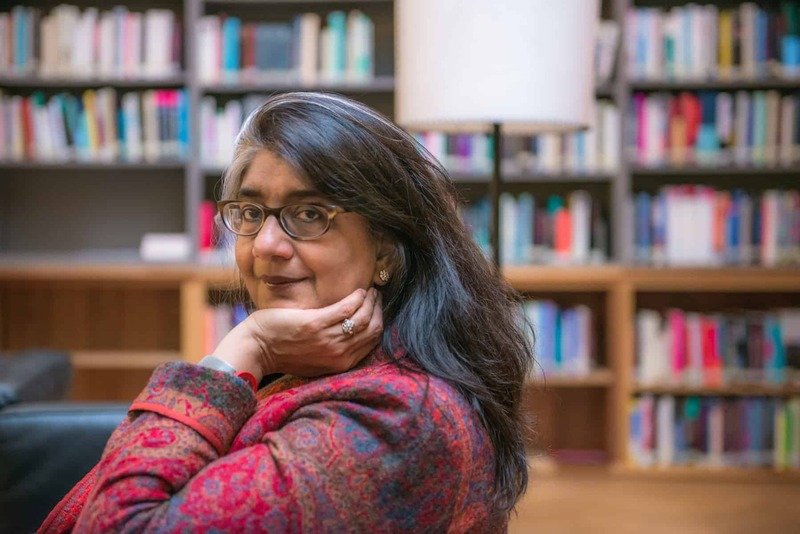 Shalini Randeria, a sociologist and social anthropologist focused on legal pluralism and global inequalities, is the Rector of the Institute for Human Sciences (IWM) in Vienna and an IIASA Distinguished Visiting Fellow. On 9 March, she gave a keynote lecture in Vienna entitled, “Precarious livelihoods, disposable lives, and struggles for citizenship rights,” as part of the IIASA-Austrian Academy of Sciences public event, Human Capital, Geopolitical Complexities, and our Sustainable Future. Q. Why do you say that globalization is full of contradictions? A. We are living in paradoxical times. The global spread of democracy has gone hand in hand with the erosion of its substance. Decisions once made by national parliaments are now made by supranational institutions, reducing the say of citizens in public decision-making. As people feel disenfranchised, trust in our governments fades. Sometimes going to court seems to be the only way to make governments accountable to citizens. This development not only expands the power of the judiciary but also politicizes it. What role does globalization play in the inequality between Global North and Global South? Neo-liberal economic restructuring has increased inequalities between countries but also within each society. We are witness today to an unprecedented concentration of income and wealth, which is not an unforeseen consequence of economic globalization but the result of deliberate public policies. The global South, however, is no longer a geographical category. Greece is an example of European country dependent on international finance institutions in much the same way that once so-called developing countries were. Shalini Randeria © IWM / Dejan Petrovic. You say that economic and political processes render some lives disposable – what do you mean by that? Take India for instance: since the country’s independence in 1947, every year some 500,000 people—mostly small farmers, agricultural workers, fishing and forest-dwelling communities —have been forcibly displaced to make room for gigantic infrastructure projects. They have become development refugees in their own country. These people are regarded as ‘dispensable’ by the state in the sense that their livelihoods are destroyed, their lives disrupted, and they are denied access to common property resources. These populations are the human waste that is sacrificed at the altar of an unsustainable model of incessant economic growth. The Sustainable Development Goals (SDGs), adopted last year, include aims to end poverty, ensure access to employment, energy, water, and reduce inequality, at the same time as preserving the environment. What challenges do you see for achieving these goals? The SDGs will prove to be an important milestone, if they are implemented the world over. Some of these goals are in conflict with one another. Take the protection of biodiversity, for example, which is often constructed as an antagonistic relationship between society and nature In the new global regime of biodiversity consveration, nature is portrayed as self-regulating, as a pristine, uninhabited wilderness that is threatened due to the wasteful resource use by local populations. Thus access and traditional usufruct rights are curtailed, and indigenous knowledge is devalued and marginalized. The (post)colonial transformation of landscapes into “environment,” “natural resources,” and “biodiversity” has enclosed the commons in most regions of the global South and often commercialized them. The idea of the Global Commons as spaces and resources that all have access to and also have the responsibility to protect is a useful one in this context. The oceans are but one example of the global commons that include water, forests, or air, which are all being increasingly privatized. The Global Commons also include common resources developed by humans such as virtual data, knowledge, computer software, and medication..
What needs to be done by international institutions to make significant progress in achieving the SDGs? Eliminating poverty will need an understanding of it that goes beyond a merely economic one. One will need to take into account possibilities of democratic participation, access to public goods and infrastructure, as well as civil rights and a restoration of a plurality of livelihoods. But these institutions also need to be reformed as they have a serious democracy deficit, be it the EU or the Bretton Woods institutions. Unaccountability of international institutions and powerful corporations along with stark asymmetries of power between these and the nation-states characterizes the new architecture of global governance, which need to be remedied urgently if we are to realize global justice. Tarja Halonen was the 11th President of the Republic of Finland and Finland’s first female head of state from 2000 to 2012. She currently serves as the Co-Chair of the UN High-level Panel on Global Sustainability, and the Chair of the Council of Women World Leaders. 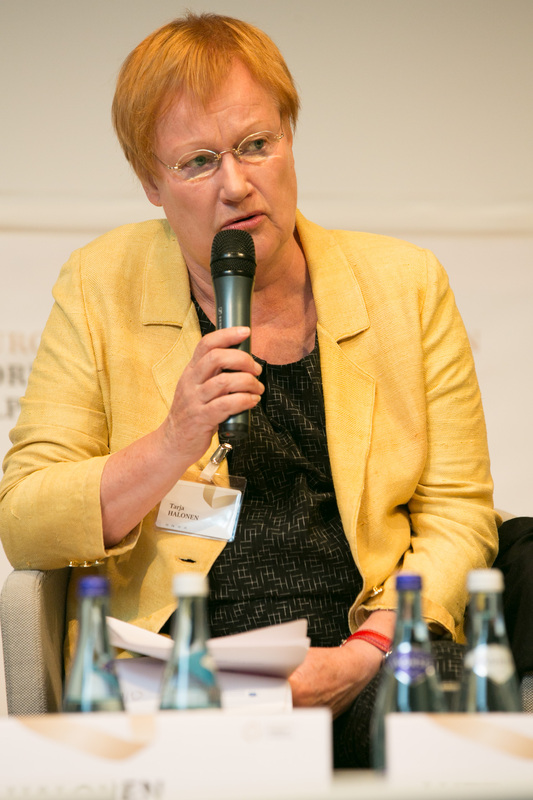 She is also a member of the high-level reflection group, the Alpbach-Laxenburg Group. IIASA: How have you been involved in the formation of the Sustainable Development Goals? Why is this process important? TH: I have been involved in this process since the development of the Millennium Development Goals, and I consider that it is very important that we continue to work for these principles after the implementation of the millennium goals has ended in 2015. In spite of all of their weaknesses the Millennium Development Goals were important goals, informing the knowledge and expectations that we have regarding sustainable development and a global climate agreement or commitment. To me, the post-2015 Agenda and the Sustainable Development Goals, are perhaps the most important guarantee for the future of the world. What is different about the approach of the Alpbach-Laxenburg Group? We have said many times—and many world leaders agreed at Rio+20—that it is time to stop working in silos. We need a multidimensional approach, where academia, politicians, business, civil society, and also NGOs are involved. This is where the Alpbach-Laxenburg Group is so important. I think that this group is an effort to address that need, and I hope that by bringing together the various areas of society we can address the great social injustices in the world. It is not only the business of scientists what happens in the world. It is not just someone else’s problem: everyone needs to be involved in the process. How do you hope to see the issues of gender inequality reflected in the group? In 2012 I was co-chair of a report entitled “Resilient People, Resilient Planet: A Future Worth Choosing” for the UN Secretary General, as part of my role on the High-level Panel on Global Sustainability. While compiling this report we noticed that there are a lot of resources that are overused and which cause problems. However, what is underused is human capital. There are three categories we should focus on: the poor, youth and women. Of course all of these groups are very important to include. But for women, inequality is a lifelong story that you cannot get rid of. It is very important to take these issues seriously and implement measures to change the status quo. I have already tried in many ways, and of course the Council of Women World Leaders has already done a lot of work which I am very thankful for. I am also very proud of Michelle Bachelet, current President of Chile, and the first Under-Secretary General and Executive Director of UN Women, who has led work on the empowerment of women at all levels. We need to make an effort to strengthen gender and women’s rights as part of the post-2015 goals. There are many similar attempts to raise this issue but I hope this group can make it a stronger voice. Poverty eradication and climate change: Is there a conflict? Many people associate raising living standards in developing countries with increases in greenhouse gas emissions. But would improving access to basic needs—such as water supply and nutrition to poor households in Africa—have the same impact on climate change as increasing affluence—people moving to the suburbs, buying bigger homes, and buying cars? New research that we published this week shows that in fact, it may take fewer emissions to raise the poor’s basic living standards than it does to grow affluence. If this is the case, then progressive development policies may well support climate mitigation. Our new study suggests that climate research needs to focus on how countries’ emissions growth relates to the services people are provide. This could change how we think about development, and influence how we approach the Paris climate negotiations in 2015­ – a milestone many view as the last chance for international cooperation to guide humanity onto a safe path of climate stabilization. There are many reasons why researchers have stumbled when thinking about poverty eradication and climate change mitigation. First, poverty is itself a debated concept. Much of the development community has moved beyond thinking of poverty just as income. We now include measures of other deprivations for example food, health, and education. But metrics abound, many of which are hard to quantify and aggregate. Second, the climate research community has yet to catch up on this shift when linking growth to human-induced greenhouse gases. Countries’ growth pathways in climate scenarios are still represented solely in terms of GDP, which doesn’t say much about how that wealth is distributed or access to basic living standards. Third, data on the multiple dimensions of poverty are hard to come by, particularly for poor countries where they are needed most. In our new study, we used available data on well-recognized poverty indicators – adequate nourishment, water supply and sanitation and electricity access – to relate countries’ growth over time to these indicators and to emissions. We found that while countries’ GDP has grown largely in proportion to emissions, access to these basic needs has grown in the majority of developing countries without proportionate emissions increases. Furthermore, in a handful of countries (such as Costa Rica, Armenia, Kyrgyzstan, and others) over 90% of the population have access to these basic needs with total emissions of less than five tons of CO2 equivalent per capita, which is well below the world average of 6.3 tons per capita. Much more research is needed before we can assess whether other countries can raise living standards with low carbon emissions growth. Indeed, increased energy access is a primary driver of greenhouse gas growth, and the energy needs of basic human development aren’t well understood, although we have begun to characterize economy-wide energy needs besides providing modern energy to homes. Countries with different fuel endowments and climate may require different energy and emissions to achieve the same progress in human development. Understanding the climate impacts of poverty alleviation can be useful for international climate policy. One can identify opportunities and challenges for basic human development within the limited carbon space available if we are to keep global average temperature rise within 2-3 degrees C. Second, it can offer a way to differentiate mitigation efforts among developing countries by recognizing and quantifying emissions associated with basic needs. The lack of a successful agreement on other efforts-sharing regimes over the last twenty years gives cause to chart new directions. Until recently, all old-age pensions in Mexico were earnings-related, financed with government subsidies and payroll taxes. For this reason only 22% of older Mexicans had pensions in the year 2000. By 2013, thanks to social pensions, coverage had risen to 88%. Social pensions are non-contributory benefits, which do not require a record of employment or contributions to a retirement scheme. In a new paper published by HelpAge International, a London-based charity, I chronicle the rise of social pensions in Mexico, and discuss what remains to be done. The rise in pension coverage began in 2001, with the introduction of a universal pension for residents of Mexico City (the Federal District) aged 70 and older. The scheme was extremely popular, and the governor, Andrés Manuel López Obrador, left office with high approval ratings. He left to campaign for the presidency, promising to extend universal pensions to the rest of the country. He was the only candidate to support a social pension in the 2006 presidential race. Although the promise of a universal pensions resonated with voters, Mr López lost narrowly to Felipe Calderón, who disliked social pensions in general, and universal pensions in particular. Despite President Calderón’s opposition to social pensions, members of Congress were able to launch a universal 70 y más pension scheme, providing monthly benefits of MX$500 (US$45) for rural Mexicans aged 70 and over. In January 2012 the unthinkable happened – Calderón in his last year of office extended the 70 y más scheme to urban Mexico. The target population (rural and urban) increased from 2.0 to 3.5 million, even though the program now excluded those with earnings-related pensions, so was no longer universal. In the meantime, 17 of Mexico’s 31 states had followed Mexico City’s lead by introducing social pensions on their own. The federal entities that introduced social pensions are diverse, and have little in common in terms of health, education, income or coverage by earnings-related pensions. Sub-national schemes also vary significantly in terms of coverage and benefit level. Interestingly, the only two federal entities to introduce universal pensions were, respectively, the most developed (Federal District) and the least developed (Chiapas). By 2012 social pensions in Mexico had shifted from a marginal political issue supported by a single political party, to one supported by the presidential candidate of each major party. Enrique Peña Nieto promised to lower the age of eligibility from 70 to 65 years. He won the election and, on assuming office, immediately extended social pensions to those aged 65-69 while continuing to exclude recipients of an earnings-related pension. Pension coverage is incomplete. Nearly one million older people have no pension. They should be added to the social pension registry as soon as possible. The social pension currently covers only half the cost of food needed for bare subsistence. It should be doubled immediately, to reach the extreme poverty line. The social pension should be extended to those with an earnings-related pension, restoring the ideal of a universal pension. Without universality, it will be difficult, perhaps impossible, to increase the size of Mexico’s social pension to the extreme poverty line or higher. Lanoi Maloiy is a PhD student at the University of South Australia in Adelaide, and a participant in the recently completed 2013-14 Southern African Young Scientists Summer Program (SA-YSSP), which IIASA co-organizes with the South African National Research Foundation and Department of Science and Technology at the University of the Free State in South Africa. In this interview Maloiy talks about her research and her experience in the program. Why did you apply for the SA-YSSP? I applied for the Southern African Young Scientists Summer Program because I envisioned the program would assist my research, especially regarding ways to improve the quality of life for Africans. I’m from Nairobi, Kenya and from the Maasai tribe. Coming from Africa, I am passionate about improving the quality of life for all of the continent’s citizens. The Maasai are a culture that traditionally didn’t often value sending girls to school, but my parents really stressed the importance of education. I have seen very clearly in my own life how having access to education makes a difference, and how it really presents a limitation for those who don’t have access to education. Especially for girls, not having that education really limits their options. This experience made me very passionate about education as a transformative tool. I believe that education is an important tool in eradicating poverty and eliminating oppression. Please tell us about your project for the SA-YSSP. My research for the SA-YSSP explores the educational experiences of Kenyan female political leaders evaluating the role of education in their leadership journey. I investigated social, cultural and historical issues regarding African women and education, including the leadership context in Africa. My doctoral work is an interdisciplinary study within the fields of gender, education, and African leadership. The study investigates the experiences of Kenyan female political leaders, and focuses on locating enablers or strategies to address the challenges women face while accessing leadership positions. During the program I worked with IIASA population researcher Dr. Anne Goujon and my South African adviser Dr. Petronella Jonck. Working with them gave my research a new social psychology perspective which really enriched my work, because I come from an education and a leadership standpoint, it broadened my research examining it from the perspective of social psychology, evaluating the interaction and dynamics of gender within society. I believe that this study will be beneficial to policy makers, and leadership practitioners. More studies on women leaders in Africa are essential to provide a global account of the experiences of women in leadership. What methods did you use to conduct your study? I did largely a qualitative study analyzing face to face interviews with 18 women political leaders in Kenya, which I had conducted in 2013. I went to where the women leaders were based, often to their constituencies or in parliament. The interviews included demographic questions, asking them about their education, qualifications, age, and marital status. Then the second half of the interview was more open ended, asking about their leadership journey, about their family background, educational background, and what factors enabled them, and factors that inhibited them, and in particular evaluating the role of education and personality. The last section of the interviews focused more on recommendations, asking their opinion on strategies that could be put into place to help women better access leadership positions. In particular, what African society could do better in terms of accommodating women, and also asking participants why it is important to have women take part in leadership, and how women leaders can enrich African society. I will be submitting my report at the end of this month, and we plan to also submit a journal article on the work. How has the program changed the way you think about or do research? The SA-YSSP has informed the way in which I communicate my research, ensuring simplicity and clarity, especially to interdisciplinary audiences. It has also equipped me as an early career researcher, with knowledge and skills to locate avenues for transforming and improving the lives of Africa’s citizens through research. What was the best thing about the SA-YSSP? 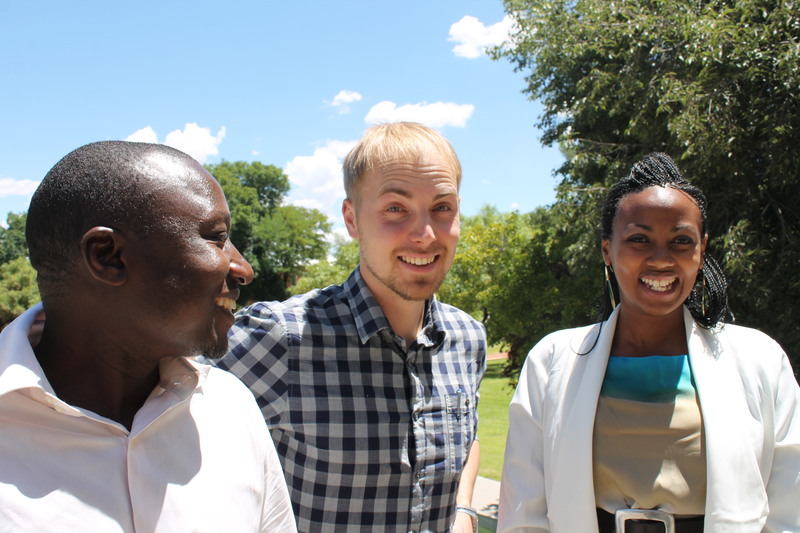 The SA-YSSP programme was an exciting and capacity building process, which provided a rich experience for me as an early career researcher. It afforded me with an invaluable learning experience. Attending lectures on writing scientific papers, systems analysis, including practical ‘hands on’ training in media communication enriched and extended my skills base. Interacting with a range of PhD students brought a new wealth of knowledge and provided a vibrant social experience. I truly appreciated the opportunity to contribute and engage in research life during the course of the summer program. Where do you hope to go with your research career? I have a strong desire to be part of research that transforms the lives of Africans, in particular through education and leadership development projects. I believe that attending the SA-YSSP has proved an important step towards my long-term goal of creating leadership development programs to improve the quality of life for Africans. A new study by IIASA researchers Katie Bowen and Vegard Skirbekk examines the stereotypes people have about older people, and what factors influence those views across a number of countries. In this interview Bowen describes the new findings and their implications. The new study shows a connection between the proportion of older people who work or volunteer in a society, and the broader perception of their competence. Why did you decide to examine perceptions about older people’s competence? A common stereotype about older people is that they are rather incompetent, that is, that people over a certain age are slower, out-of-date, less able to learn and generally less able to perform tasks in everyday life. However, the extent to which older people are viewed as incompetent varies across countries: In some countries older people are regarded as more competent, and in other countries older people are regarded as less competent. We wanted to know if there was a connection between national stereotypes of older people’s competence and the roles older people fulfill within a certain society. Since employed people tend to be perceived as being particularly competent, we thought that there might be a connection between the proportion of older people working—paid or unpaid—in a country and the extent to which older people in general are perceived as competent. Our results indicate that older adults are indeed seen as more competent in countries in which more older people work and volunteer. Importantly, our results suggest that the proportion of older people working and/or volunteering is related to stereotypes of older people’s competence over and above the actual competence of the older population. We had no indication that it matters whether older adults are participating in paid or volunteer work. Besides people’s volunteer or work participation, what other factors could explain the relationship between stereotypes about older people’s competence and the proportion of older people working or volunteering and how did you control for these factors? Being older means different things in different countries. For instance, the health of the older population, as for instance roughly indicated by average life expectancy, varies significantly across Europe. Another example is education: in some countries, the older population is highly educated, whereas in some countries the older population has only limited formal education. As a third example, since women tend to live longer than men, women tend to make up a larger part of the older population, although this varies across countries. Finally, research has shown that the objective cognitive performance of the older population also varies significantly across countries. All of these factors—health, education, gender, and cognitive performance—are also linked with perceptions of competence. For instance, men tend to be perceived as more competent than women, healthier people tend to be perceived as more competent, and so on. It could be that national stereotypes about older people’s competence reflect ‘real’ differences in the competence of the older population as captured by the educational level, health, and cognitive skills of the older population, or that differences in perceptions of older people’s competence are mixed up with stereotypes about women’s competence. Furthermore, at least in some countries, working and volunteering older people tend to be healthier, more educated and more cognitively fit relative to their non-working/volunteering peers. It was therefore important to try to separate out the extent to which national stereotypes of older people’s competence were related to the health, education and cognitive fitness of the older population versus the participation of older people in roles that allow them to demonstrate their competence. In our new study, we did this by statistically controlling for average life expectancy, education level of the older population, and proportion of women within the older population in each country. In a subsample of countries, we were also able to control for the average objective cognitive skills of the older population. When we controlled for these factors, there was a clear link between the proportion of older people participating in paid and/or volunteer work and national stereotypes of older people’s competence. What methods did you use to conduct the study? We used data from the 2008 European Social Survey (ESS). The ESS includes data from representative samples from 28 countries regarding perceptions of older people’s competence. We analyzed the data with a multi-level regression model. As our dependent variable, we used data from 43,376 individuals aged below 65 years, who indicated the extent to which older people in their country are perceived as competent. We used data from the ESS and other sources like the OECD for information on the participation of older people in paid and/or volunteer work, as well as average education of the older population, the gender ratio of the older population, and the average life expectancy in each country. For a subsample of 11 countries, we had data on the average cognitive abilities of the older population in each country from the SHARE study. Were there any surprises in your results? Well, Hungary was a bit of an outlier. According to our data, there are very positive perceptions of older people’s competence in Hungary which are not well explained by the characteristics of the older population which we included in our model. Why are the results of this study important for society? Our study shows that the opportunities that older people have for participating in a society really matter. Paid and volunteer work can be an important way for older people to demonstrate their competence. Our results imply that social policies and structural factors at the country level that create opportunities for older adults to participate in work and volunteer roles may contribute to more positive perceptions of older adults’ competence. This matters not only for older people, but also for younger people who form expectations about their own aging based in part on how they perceive older people over the course of their lifetime. Several longitudinal studies have now demonstrated that what you expect from aging is what you get: people with more positive perceptions of aging tend to actually age better. The takeaway of our study is this: social institutions influence the roles that older people have in society, and roles contribute to how older people are perceived. “Our study shows that the opportunities that older people have for participating in a society really matter,” says Bowen. Katie Bowen is a developmental psychologist interested in understanding how social (e.g., country-level) and individual predictors together influence patterns of adult development. To date her research has focused on images of aging (i.e., mental representations of older people and the aging process), aging and the work context, and adult personality development. Bowen joined IIASA’s World Population (POP) program in November 2013, to research social and individual predictors of longevity preferences.